This article is about the Algonquin of Quebec and the Ottawa Valley. For the large number of peoples speaking Algonquian languages, see Algonquian peoples. 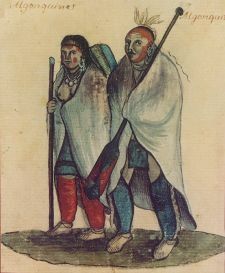 Algonquin Couple, an 18th-century watercolor. The Algonquins (or Algonkins) are an aboriginal North American people speaking Algonquin, an Anishinaabe language. Culturally and linguistically, they are closely related to the Odawa and Ojibwe, with whom they form the larger Anicinàpe (or Anishinaabe) grouping. The Algonquins were unfortunate in their contact with Europeans. They were initially met by the French, with whom they became trading partners. However, this alliance led to antagonism against the French by the powerful Iroquois, historically enemies of the Algonquins. Aided by the Dutch and the British, the Iroquois soon triumphed over the French and their Algonquin friends. Additionally, French efforts to convert the Algonquin to Catholicism led to division among them; some accepting the new religion while others resisted and retained their traditional beliefs. Today, most Algonquins live in Quebec; the nine Algonquin bands in that province and one in Ontario have a combined population of about 8,000. Despite being decimated by European-borne disease and hardship due to conflicts, Alqonquin descendants have survived. Contemporary Algonquin communities are working to preserve Algonquin language, culture, and territorial jurisdiction. They remain a strong and distinct people. The Algonquin people call themselves either Omàmiwinini (plural: Omàmiwininiwak) or the more generalized name of Anicinàpe. Many Algonquins still speak the Algonquin language, called generally as Anicinàpemowin or specifically as Omàmiwininìmowin. The language is considered one of several divergent dialects of the Anishinaabe languages. The term "Algonquin" is French, and may derive from the Maliseet word elakómkwik (IPA: [ɛlæˈɡomoɡwik]), "they are our relatives/allies". Alternatively, it may come from the Mi'kmaq word meaning "at the place of spearing fish and eels from the bow of a canoe." Another possibility is the Maliseet word for "dancers," which Samuel de Champlain might have mistaken for their tribal name while watching a combined Algonkin, Maliseet, and Montagnais victory dance in 1603. The tribe has also given its name to the much larger, heterogeneous group of Algonquian-speaking peoples who stretch from Virginia to the Rocky Mountains and north to Hudson Bay, referred to as the Algonquian peoples. Popular usage reflects some confusion on this point, in that the term "Algonquin" has also been used to refer to all Algonquian-speaking societies. In the earliest oral history, the Algonquins came from the Atlantic coast. Together with other Anicinàpek, they arrived at the "First Stopping Place" near Montreal. While the other Anicinàpe peoples continued their journey up the Saint Lawrence River, the Algonquins settled along the Kitcisìpi (Ottawa River), an important highway for commerce, cultural exchange, and transportation. A distinct Algonquin identity, though, was not fully-realized until after the dividing of the Anicinàpek at the "Third Stopping Place," near present day Detroit, around 2,000 years ago. Archaeological sites on Morrison Island in the Ottowa River near Pembroke reveal a 1000-year-old culture that manufactured copper tools and weapons. Copper ore was extracted north of Lake Superior and distributed down to northern New York State. Local pottery artifacts from this period show widespread similarities that indicate the continuing use of the river for cultural exchange throughout the Canadian Shield and beyond. Some centuries later the Algonquin tribe moved in and inhabited the islands and shores along the Ottawa, and by the 1600s the first Europeans found them well-established as a hunter-gatherer society in control of the river. Algonquin communities consisted of a number of separate bands, each with its own chief. The Kitcisìpiriniwak ("Ottawa River Men"; singular: Kitcisìpirini, from Kitcisìpi meaning "Great River," their name for the Ottawa River) were the largest group. On Morrison Island, at the location of where 5,000-year-old copper artifacts were discovered, the Kitcisìpirini band levied a toll on canoe flotillas descending the river showing a strong entrepreneurial spirit. With their village located on the island, the Kitcisìpiriniwak did not change location with the seasons, unlike the other Algonquin communities. Other Algonquin bands included the Wàwàckeciriniwak (also known as the Weskarini, and the Algonquin proper), who lived along the north side of the Ottawa River. After contact with the Europeans, the Algonquins became one of the key players in the fur trade. At the time of their first meeting with the French in the early seventeenth century, the various Algonquin bands probably had a combined population somewhere in the neighborhood of 6,000. The first group of Algonquin that the French encountered were the Kitcisìpiriniwak whose village was located on an island in the Ottawa River; the French called this group La Nation de l'Isle. The first recorded meeting between Europeans and Algonquins occurred at Tadoussac in the summer of 1603, when Samuel de Champlain came upon a party of Algonquins, led by the Kitcisìpirini Chief Tessouat. They were celebrating with the Montagnais and Etechemins (Malecite) a recent victory over the Iroquois. At first, the term "Algonquin" was used only for a second group, the Wàwàckeciriniwak. However, by 1615 the name was applied to all of the Algonquin bands living along the Ottawa River. Because of keen interest to gain control of the lower Ottawa River the Kitcisìpiriniwak and the Wàwàckeciriniwak came under fierce opposition. These two large groups allied together, under the leadership of Sachem Charles Parcharini, maintaining the Omàmiwinini identity and territory. The Algonquin Indians were the victims of unfortunate European politics. When the French arrived trading firearms for furs, the Algonquins responded to the opportunity to establish an alliance. Though the French were good friends to the Algonquins, they did not make such good allies. The powerful Iroquois, historically the enemy of the Algonquins, aided first by the Dutch and later by the English, defeated the French and their Algonquin allies. In 1632, after Sir David Kirke's occupation of New France had demonstrated French colonial vulnerability, the French began to trade muskets to the Algonquins and their allies. French Jesuits began to actively seek Algonquin conversions to Roman Catholicism, opening up a bitter divide between traditionalists and converts. Until 1642, the Iroquois had never dared to attack the Kitcisìpirinik fortress, but then a surprise winter raid hit the Algonkin, inflicting severe casualties while most of their warriors were absent. Then, on March 6 (Ash Wednesday), 1647, a large Mohawk war party hit Kitcisìpiriniwak living near Trois-Rivières and almost exterminated them. Some joined the mission at Sillery and were mostly destroyed by an epidemic by 1676. The Sulpician Mission of the Mountain was founded at Montreal in 1677, and some Algonquins settled there together with Iroquois converts. However many did maintain attachment to the traditional territory and the trading traditions. While those that agreed to move to the established reserves or joined other historic bands and were then federally "recognized" by the Canadian authorities, many others did not re-locate and were later referred to as "stragglers" in the Ottawa and Pontiac Counties. Some, encouraged by the French, had remained at Trois-Rivières and their settlement at nearby Pointe-du-Lac remained until about 1830, when the last 14 families, numbering about 50 persons, moved to Oka. Starting in 1721, many Christian Algonquins had began to summer at Oka, a Mohawk settlement near Montreal that was then considered one of the Seven Nations of Canada. Algonquin warriors continued to fight in alliance with France until the British conquest of Quebec in 1760. Fighting on behalf of the British Crown, the Algonquins took part in the Barry St. Leger campaign during the American Revolutionary War. The British estimate of their population in 1768 was 1,500. Loyalist settlers began encroaching on Algonquin lands shortly after the Revolution. Later in the nineteenth century, the lumber industry began to move up the Ottawa valley, and the remaining Algonquins were relegated to a string of small reserves. Although the historical Algonquin society was largely hunting- and fishing-based, some Algonquins practiced agriculture and cultivated corn, beans, and squash, the famous "Three Sisters" of indigenous horticulture. Traditionally, the Algonquins lived in cone-shaped tipi-like dwellings, rather than the usual North Eastern dome-shaped wigwams. They also built rectangular hunting shelters. Bring primarily a hunting culture, mobility was essential. Material used had to be light and easy to transport. Canoes were made of birch bark, sowed with spruce roots and rendered waterproof by the application of heated-up spruce resin and grease. It was easy to move and the material readily available. During winter, toboggans were used to transport material and people used snowshoes to walk on the snow. For babies, they constructed tikinàgan (cradleboards) to carry them. They were built with wood and covered with an envelope made of leather or material. The baby was standing up with his feet resting on a small board. The mother would then put the tikinàgan on her back. This allowed the infant to look around and observe his surroundings, therefore start learning how everyday tasks were done. The Algonquins were practitioners of Midewiwin, the secretive religion of the aboriginal groups of the Maritimes, New England, and Great Lakes regions in North America. Its practitioners are called Midew and the practices of Midewiwin referred to as Mide. Occasionally, male Midew are called Midewinini, which sometimes is translated into English as either "shaman" or "medicine man." Midewiwin is based on the world view (religious beliefs) of the Ojibwa people. The Algonquin believed they were surrounded by many manitòk or spirits. The "Great Spirit" was the creator of the world, a supernatural power inherent in all things, both living and non-living. There were also many lesser spirits, both good and evil. Dreams were of particular significance, and their interpretation was an important responsibility of the shamans. Their shamans were believed to be able to communicate with the spirit world, and thus their guidance was sought by hunters for success in the hunt, for healing the sick, and generally for guidance on important matters of life. They believed that after death the spirits of hunters went on to pursue the spirits of animals. They also had a great fear of witchcraft, fearing to use their real names in case of misuse by enemies with spiritual power and evil intent. With the arrival of the French, many Algonquins were proselytized to Christianity, but many still practice Midewiwin or co-practice Christianity and Midewiwin. In the early twenty-first century, almost 8,000 Algonquins in Canada were organized into ten separate First Nations: nine in Quebec and one in Ontario. They occupy territory along the Ottawa River valley which forms the present border between Ontario and Quebec. In 1982, members of the Algonquin tribe successfully blockaded a commercial rice-harvesting venture that was given federal governmental permission to harvest the wild rice that the tribe has traditionally gathered by hand for centuries. Hundreds of people blockaded roads, and despite police helicopters, paddywagons, and "a lot of hostility and pushing and shoving," according to Harold Perry, honorary chief of the Ardoch Algonquins, the tribe and its supporters held their ground for 27 days—long enough for the federal government to reverse its decision and revoke the commercial permit. Tensions with the lumber industry have flared up among Algonquin communities, in response to the practice of clear-cutting. In Ontario, an Algonquin land claim from 1983 called into dispute much of the southeastern part of the province, stretching from near North Bay to near Hawkesbury and including Ottawa, Pembroke, and most of Algonquin Provincial Park. In 2000, Algonquins from Timiskaming First Nation played a significant part in the local popular opposition to the plan to convert Adams Mine into a garbage dump. Members of the Algonquin tribe began a peaceful blockade of a uranium mining operation on their sacred lands north of Kingston, Ontario on June 29, 2007. ↑ William Bright. Native American Place Names of the United States. (Norman, OK: University of Oklahoma Press, 2007, ISBN 0806135980), 32. ↑ 2.0 2.1 Barry M. Pritzker, A Native American Encyclopedia: History, Culture, and Peoples (New York, NY: Oxford University Press, 2000, ISBN 0195138775). ↑ 3.0 3.1 Lee Sultzman, Algonkin History, 1999. Retrieved April 29, 2009. ↑ For example T. J. Campbell. Algonquins in the Catholic Encyclopedia, Eleventh ed. (1911) Retrieved November 13, 2007. ↑ Michael Angel, Preserving the Sacred: Historical Perspectives on the Ojibwa Midewiwin (Winnipeg, MB: University of Manitoba Press, 2002, ISBN 0887556574). ↑ Robert L. Hall, An Archaeology of the Soul: North American Indian Belief and Ritual (Chicago, IL: University of Illinois Press, 1997, ISBN 0252066022). ↑ Bob Lovelace An Algonquin History Retrieved November 26, 2007. ↑ Ardoch Algonquin First Nation (August 23, 2007) Algonquin Alliance Protest Update Retrieved November 26, 2007. Sultzman, Lee. Algonkin History, 1999. Retrieved April 29, 2009. This page was last modified on 5 March 2019, at 23:05.